Debras purpose for writing this book was to give you, the reader, a chance to understand the uniqueness of your personality. 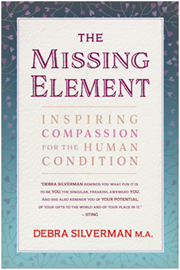 In this inspiring conversation, Astrologer Debra Silverman and Genetic Intuitive Cyndi Silva discuss an Astrological overview for 2018 as well as Debra's book, The Missing Element: Inspiring Compassion for the Human Condition. Silverman provides a language that allows you to have compassion for how different, weird and individualistic we each are. Included is a personality test, in the middle of the book, that distinguishes the 4 types: 1-water, emotional, 2-air thinker, 3-earth practical and 4- fire the energizer. Find out which one you and even more importantly: which one you are missing. Debra is part comedian, part psychologist, part astrologer and ALL REAL. She helps people turn on their own inner observer, to see the things they say and do in a totally objective way. 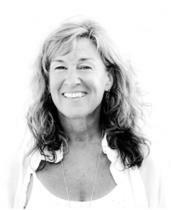 Debra has been in private practice for over 40 years. She uses astrology and her own system called the The 4 Elements (or 4E for short) as tools to help people step into their power. Debra’s mothering approach to understanding and empowering people from all walks of life has earned her international fame and admiration. She has written a book, magazine columns, hosted a radio show and has a YouTube channel with over 3 million views. She is dedicated to creating community and working for the children. Debra believes the future is arriving and none of us can do it alone. She is an expert in embracing the feminine, and her ultimate dream is to revolutionize therapy by teaching therapists how to provide custom treatment to their clients. Debra believes in the power of listening. When we are silent - both with ourselves and each other - the messages that are trying to come through us can be given a voice, and we can all start walking our authentic and powerful path. She splits her time between Kauai and Boulder, Colorado where she enjoys talking to the beautiful flowers, daily swims and spending time with friends and family.